It was on April 14, 2012 - exactly 100 years ago to the day that the ill-fated ocean liner, Titanic, struck an iceburg - that my family and I made our way to The Henry Ford Museum in Dearborn, Michigan, and viewed with awe the wonderful exhibit dedicated to the ship. While we waited to 'board' the Titanic, I thought I'd take the opportunity to give a quickie tour of the Henry Ford Museum to my then future daughter-in-law. I pointed out just some of the amazing collection of historical items this place has, such as the camping equipment once belonging to George Washington and a writing desk once owned by Thomas Jefferson. But the piece of American history that I felt was most significant to see on this particular date - April 14 - was originally owned by Henry (Harry) Ford (no relation to the auto-magnet). Harry happened to work at the Ford Theater in Washington as the treasurer. 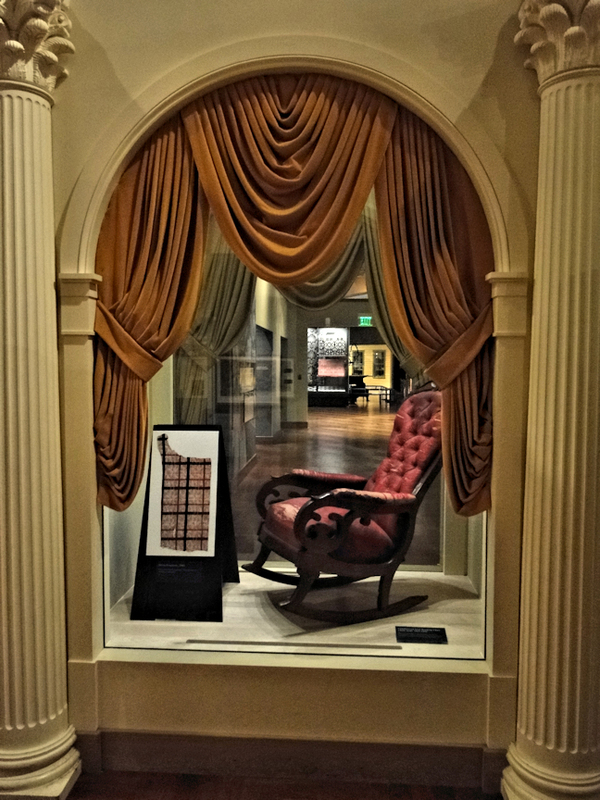 When he had heard that President Lincoln was coming to catch the performance of the play "Our American Cousin" he brought in a rocking chair that was originally part his bedroom furnishings; he felt it was suitable for such an important man. I don't believe I need to go into the details of what occurred next - hopefully, those of you reading this know what happened on that fateful April 14 in 1865 in Washington City (Washington D.C.)...the evening the President Lincoln was shot...but I did explain it in some detail to my future daughter-in-law who, though she was aware of Lincoln's assassination, was not aware of many of the details pertaining to it. Other visitors near us, by the way, heard me speaking about the Lincoln events of this night and gathered around the display to eye the chair with a bit more reverence. 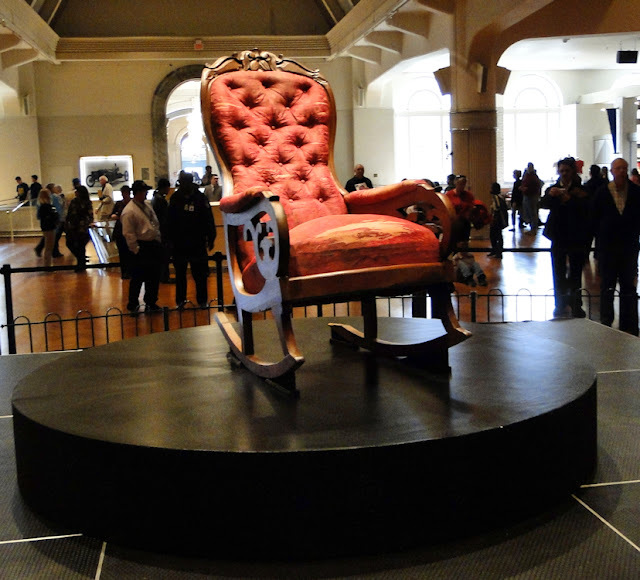 I must admit that being there, 147 years to the day, staring at what is perhaps the most famous chair in American history, still sends chills down my spine. But it actually didn't necessarily end there, for three years later, on the actual 150th anniversary of this tragic event, the curators of The Henry Ford Museum brought the chair out of its permanent temperature-controlled glassed-in exhibit (see above left), which is part of the 'With Liberty and Justice For All' exhibit, and into the open for the public to see up-close and personal, something that, to my knowledge, hasn't occurred in decades. Of course, I was there taking all kinds of pictures, for who knows when such an occurrence might happen again. here we see the infamous Lincoln Rocker up close and personal. 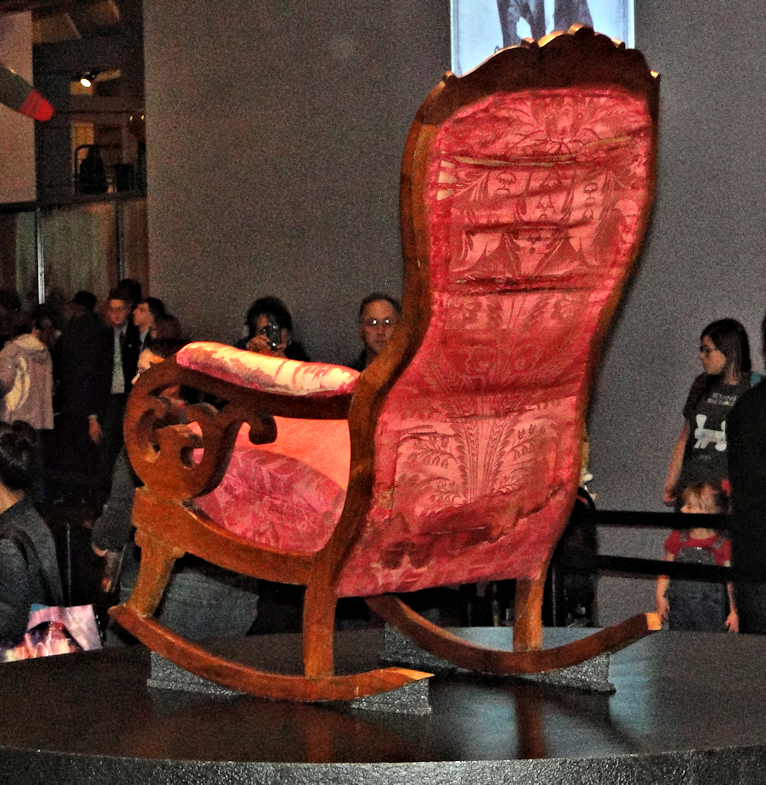 So how did automobile magnate Henry Ford acquire such a historical object as the Lincoln Rocker? When Ford began collecting all things American back in the early days of the 20th century, folks from all over were very happy to help him out by sending him all of their "junk" they had stored in their basements and garages. 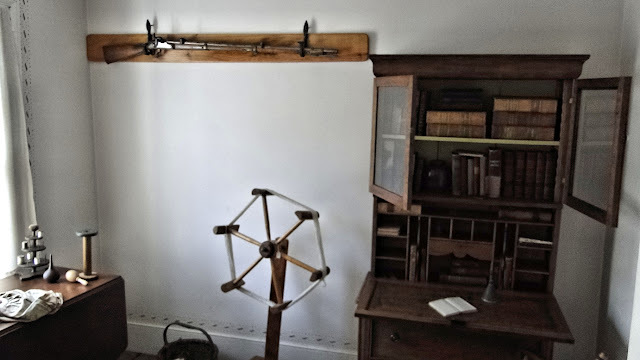 Items of little use, including old-time farm implements, cooking and heating stoves, yarn winders, eating utensils, furniture, watches & clocks, spinning wheels, guns, tools, toys...the list goes on and on. 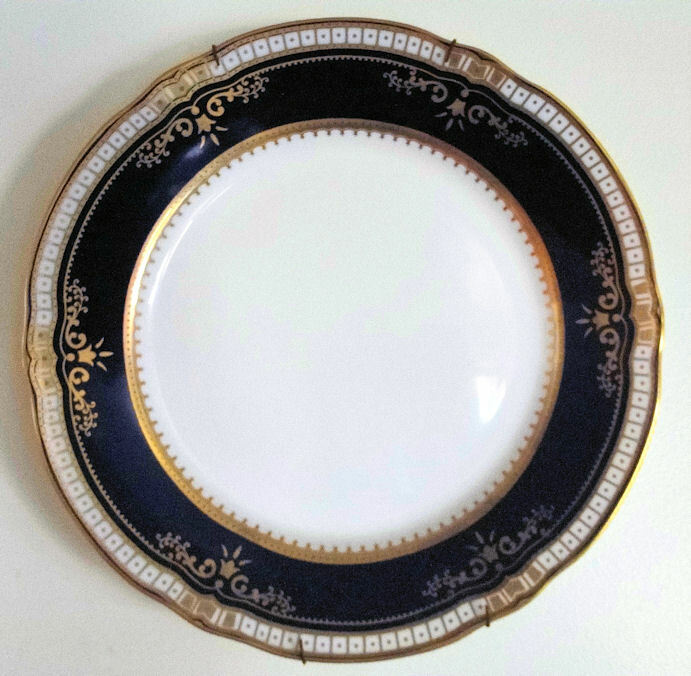 Little did they know that what they were giving away (and in some cases, selling) would one day become museum pieces - objects that told the story of the average (and not-so-average) American of the 18th and 19th centuries. Other museums at the time held paintings of the great artists, furniture of kings and queens, and items that people of great wealth once owned. But that wasn't what Mr. Ford was interested in. He wanted to show the things that made America great. He wanted the light to shine on folks like you and me - everyday people. As the collection grew to an enormous measure, Ford realized he needed a place to store all of his treasures and decided to build a museum, originally called the Edison Institute, after his hero Thomas Edison. The collection of Americana here is mind-boggling. 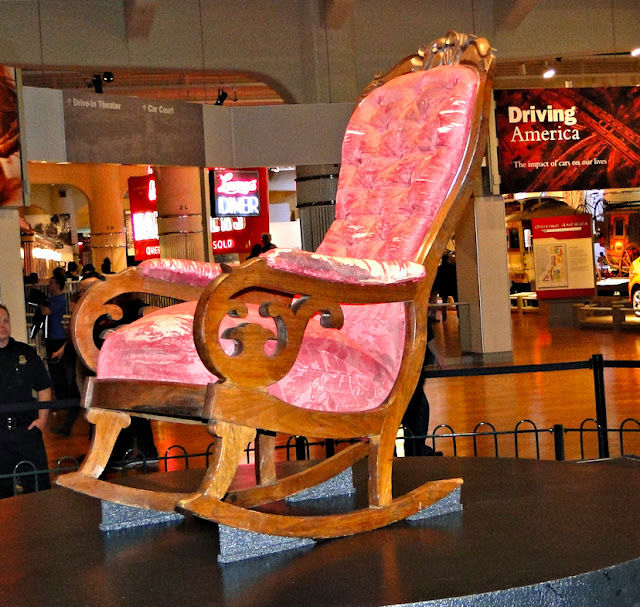 But, of everything in the collection inside the Henry Ford Museum, there is nothing as unique a piece of American History that goes beyond the scope of what other museums have, including the Smithsonian has: the Lincoln Rocker. And a clear look at of the back of the chair. 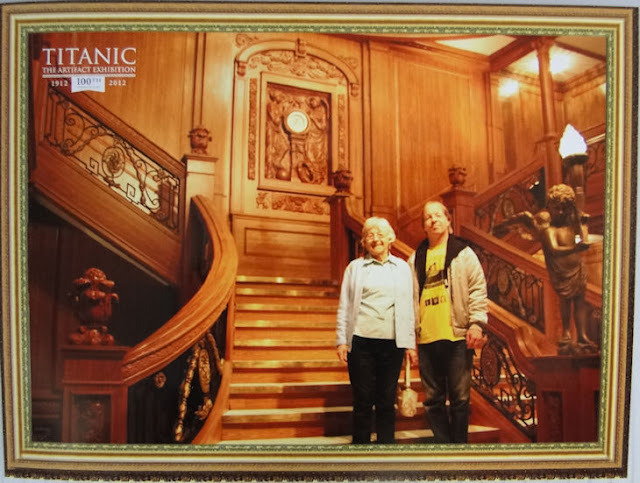 Going back to our April 14, 2012 visit to The Henry Ford Museum: as I mentioned, on this particular date and time the museum also had an amazing exhibit about the Titanic. And given the fact that it was the 100th anniversary to the date made it all the more haunting. Inside, the exhibit was laid out very well. There were many original artifacts brought up from the wreckage site at the bottom of the ocean including cups, bowls, and plates, some articles of clothing including a work shirt and a bowler hat, eyeglasses, a tape measure, toothpaste bowl, shaving kit, bottles of perfume with some of the 'smellum' still inside, cooking oil with some oil still inside as well, cooking pots, sheet music, a boat whistle, jewelry, and just so much more. 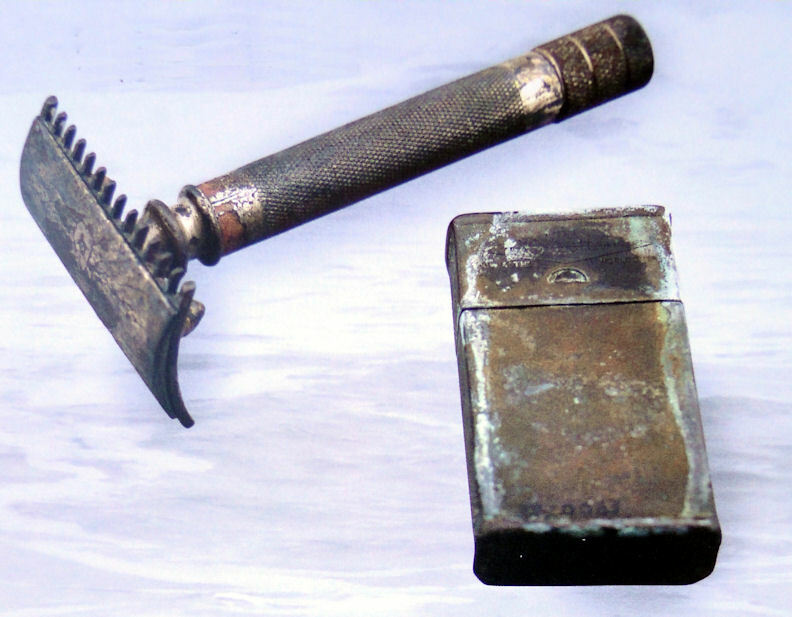 To think that these items survived after sitting at the bottom of the ocean from 1912 to 1985, and now we can view them! As we moved along we suddenly found ourselves staring down a very authentic reproduction of the 1st class hallway – my gosh! I must’ve stood in that part for over five minutes just taking it all in. It truly felt like you were there, if only for split second intervals. Then, turning the corner we came upon – this was awesome – the Grand Staircase. Yes! - - - there it was, in all its opulent glory! Just as I'd seen in old photographs and in the movies! This was another one of those you are there moments (I suppose it takes a deep love and passion for history to get these moments). As a family, we had our photograph taken as we stood upon the steps of this magnificent reproduction. For some reason, the RMS Titanic corporation does not allow photography inside their exhibit, but they did have their own photographer there offering to take pictures...for a price. Yes, I fell for it - it was just too amazing to not have a souvenir like this. Another interesting reproduction was of the lower level steerage corridor, including the constant sound of the great ship's motor rumbling in the background, which those in steerage heard. They had also reproduced a 1st class and a 3rd class cabin side by side so one can see easily the class difference. The rich expected such elegance, but for the poor, the third class accommodations were, in many cases, much better than what they were used to. There are some who feel that nothing should have been brought up from the wreckage, that it should have all remained two and a half miles down below the ocean in complete darkness as a memorial. I cannot think of a better way to remember than to have these items displayed in such a way and to see them with one's own eyes. It's in this way the legacy can be carried on for generations. 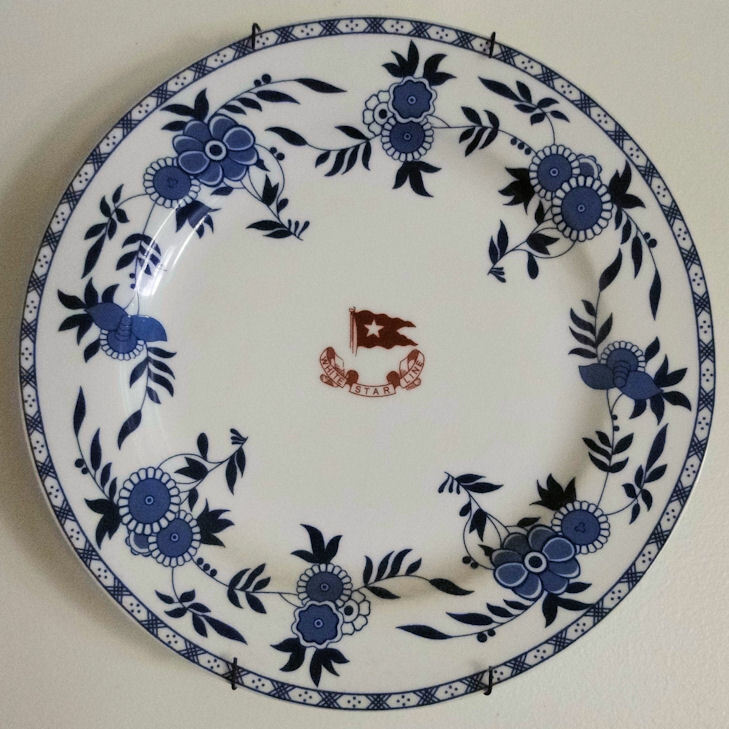 That’s why I have no problem with them bringing up the artifacts for this purpose – and only for this purpose of display and remembrance, not for private ownership. 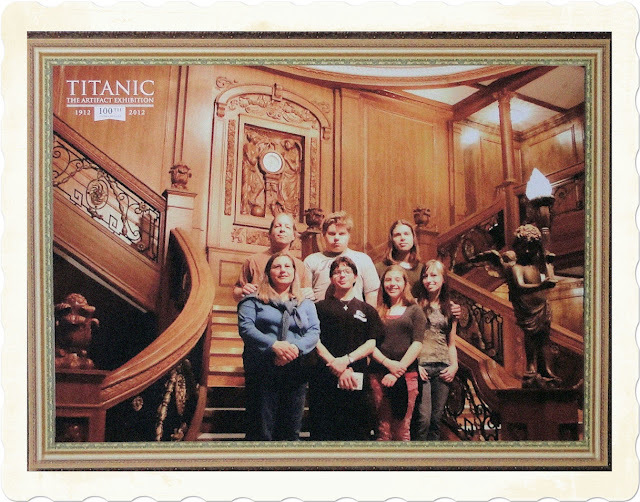 The Titanic exhibit is magnificent , and I plan to visit at least once or twice more before it ends in September. 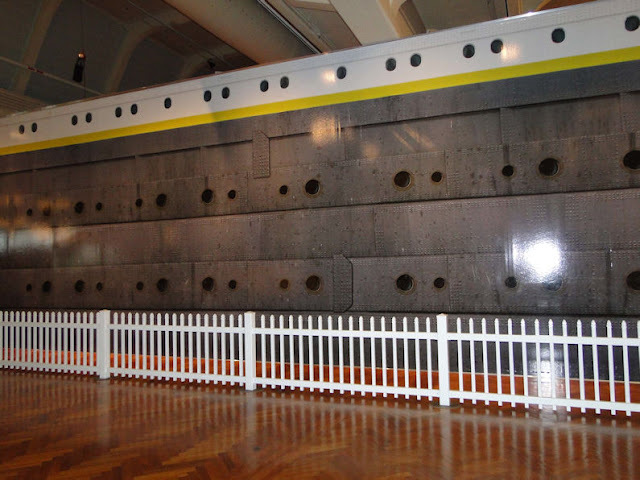 ~ it's the most historically accurate portrayal of the ship itself, taking the viewer in nearly all areas of Titanic (except for the 2nd class - that area is noticeably missing) including into the boiler rooms. The attention to detail is astounding. ~ the picture and sound quality of the movie draws the viewer right in. Modern technology can help bring the past to life, can't it? ~ and finally, I just really like this version. Watching the movie directly after seeing the exhibit was, simply put, an engulfing experience. And knowing that this day was the 100th anniversary of the Titanic hitting the ice burg, I felt it was a fine way to pay tribute – not all tributes and memorials need to be sullen. Just respectful. A week after I wrote this post I took my then 82 year old mother to Greenfield Village and then to the Titanic exhibit. She loved both! Experiencing history is my solace. Many co-workers and friends of mine look at me sideways at my love for history, especially of the American variety. And to research the story behind the objects can make all the difference in the world, especially in an attempt to gain interest from others, especially kids. I hope for April 14th, and even April 15th (for that's the date when Lincoln actually died from his wounds, and the date when Titanic actually sank), you will give a small commemoration, whether by reading some of the many books on both subjects, or even watching a quality movie (there are a few of those, believe it or not, such as "Lincoln" starring Daniel Day-Lewis or the infamous "Titanic" movie from the 1990s. Maybe even simply reading this blog post. Until next time, see you in time. Just who were these "dozens of other riders," and how did the plan to get the word out to the people in this pre-mass communication age work? Never fear, for there was Paul Revere, and his role on how it all played out on that April night nearly 245 years ago shows he is worthy of the praise he has since received, as you shall see. I have already written a posting on Revere's partner, William Dawes. And I have written about Sybil Ludington, the so-called female Paul Revere, who, we are told, experienced a pretty harrowing ride of her own, though it occurred two years after, almost to the day of Revere's most famous of rides, on April 25, 1777. And so, now it's time to get a few more of the names of the riders who helped the Patriots to win what is widely considered to be the first real battle of the American Revolution. By now you hopefully know that on the evening of April 18, 1775, Paul Revere and William Dawes were dispatched by Joseph Warren to warn the countryside that the Regular Army were coming to capture guns and gunpowder kept in Concord. Revere & Dawes were also to warn Samuel Adams and John Hancock of a possible impending arrest. But these two men were not the only couriers to make a warning ride on that eventful night. 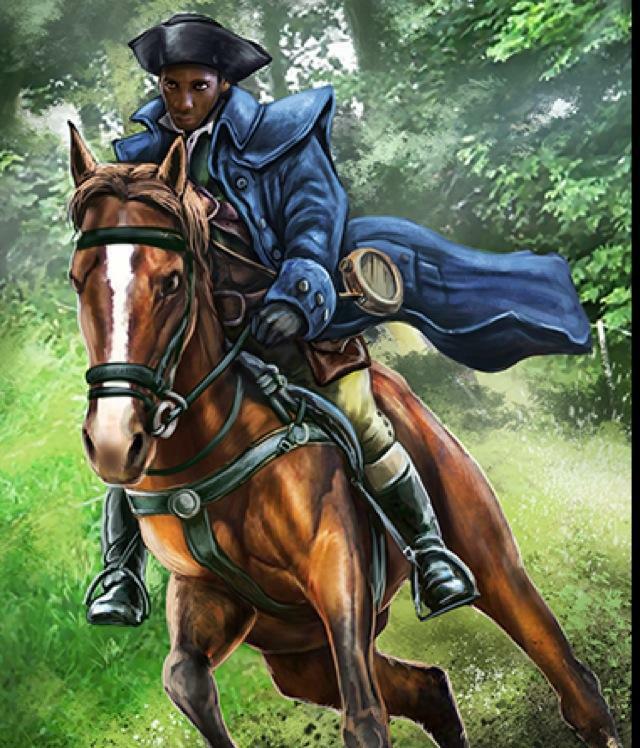 In fact, as mentioned, Revere was one of dozens who rode the countryside under the darkness of night to alert the folks of an imminent "invasion" of the King's Army, for he had previously enlisted the help of over thirty additional riders to be on the alert. He placed them across the river in Charlestown and ordered the militia leaders to look to the steeple of Christ Church (known today as the Old North Church) every night for signal lanterns, the number of which indicating when the British army was leaving Boston and by which route. So on this April 18th night, as Paul Revere arrived in Charlestown nearly an hour after he was informed of the signal, he was told that the two lights that "shewn" in the steeple window had been seen by his 'enlistments,' and that the men were already riding. He borrowed a horse and began his own ride from there. But there's more to this story than the signals beaming a soft glow from Christ Church towers, and it's in today's posting that I hope to show the other ways how these numerous informers were notified so they could also make their warning ride. I also hope to maybe identify at least a few of them, if not in name then in an acknowledgement of their brave deed, for each contributed to the eventual independence of our nation. In fact, as I was researching and writing this out, the more amazed I became, for this was quite a feat of magnificent proportion, and truly a substantial 18th century system of communication! "Many other riders helped Paul Revere to carry the alarm. Their participation did not in any way diminish (Revere's) role, but actually enlarged it. The more we learn about these messengers, the more interesting (his) part becomes---not merely as a solitary courier, but as an organizer and promoter of a common effort in the cause of freedom." The riders were spread out far and wide, and this was due to a sort of tag-team, as you shall see, for "(t)he astonishing speed of this communication did not occur by accident. It was the result of careful preparation, and something else as well. Paul Revere and the other messengers did not spread the alarm merely by knocking on individual's doors. They also awakened the institutions of New England. The midnight riders went systematically about the task of engaging town leaders and military commanders of their region. They enlisted its churches and ministers, its physicians and lawyers, its family networks and voluntary associations." 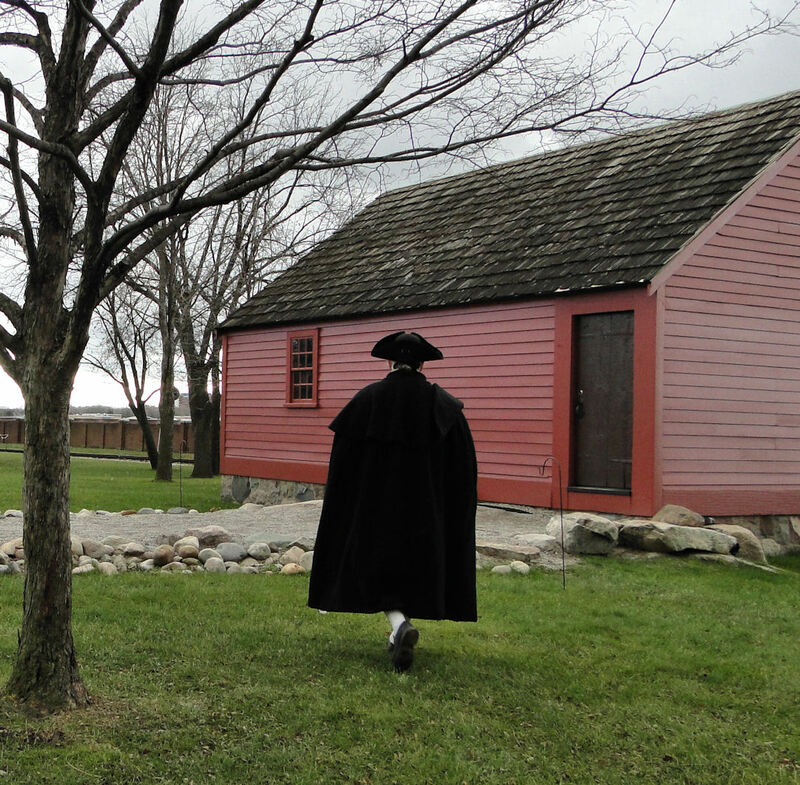 Paul Revere himself said that he had "alarmed almost every house, till I got to Lexington." Author Fischer explains, "From some of those houses men rode north and northwest to the precincts above Cambridge and Menotomy. All along his route, town leaders and militia commanders were systematically engaged---a fact of vital importance for the events that followed. Many of these towns and villages were summoned to join in the fight due to the many riders sent out by the alarm system in place. "Along Paul Revere's northern route, the town leaders and company captains instantly triggered the alarm system. Church bells began to roll and the heavy beat of drums could be heard for many miles in the night air. Some towns responded to these warnings before a courier reached them. While the alarm was spreading rapidly to the north, Paul Revere and his fellow Whigs started yet another courier in a different direction---east of Medford to the town of Malden. From Malden, the alarm was carried east to Chelsea on the Atlantic coast. 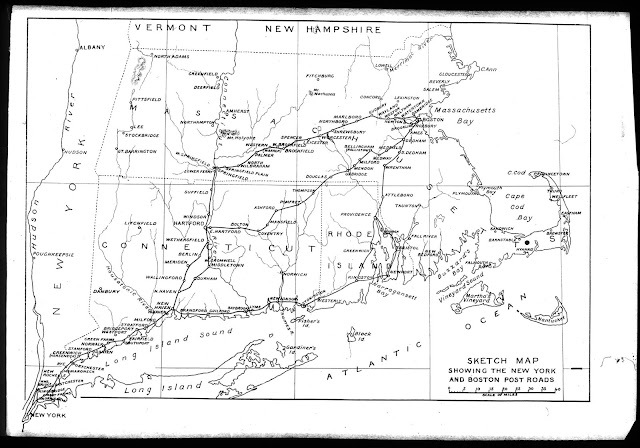 (And) "from Medford, Revere's friends started yet another express rider galloping to the northeast. He was Dr. Martin Herrick, a young Harvard graduate and a "high-toned son of liberty." 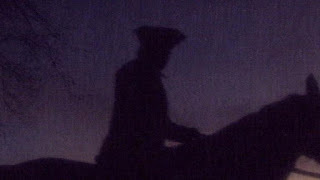 In fact, several of the riders that night were Whig doctors, for it was common practice at that time for doctors to make house calls, frequently at night, so they knew the trails well. Within a few hours, Dr. Merrick awakened a large area on the North Shore of Massachusetts Bay, and he also set other riders in motion, including one from the town of Lynn and another from Reading. 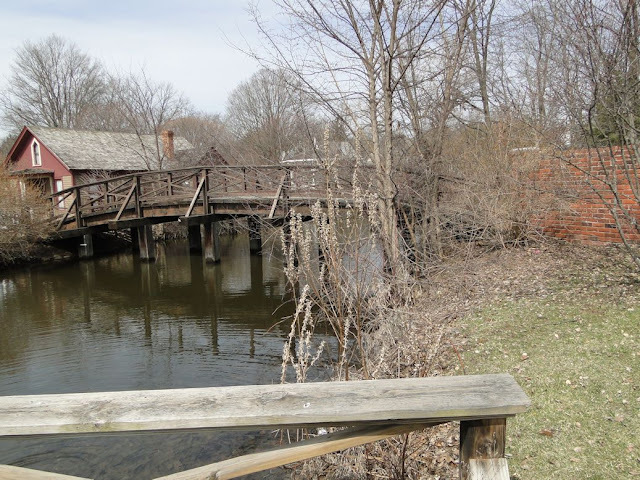 A third from North Shore rode to Andover, where a resident wrote in his diary: We had alarum that the Reegelers were gon to Conkord we gathered at the meting hous & then started for Concord." Now Samuel Prescott, who was only 24 years old at the time and also a doctor, was a Massachusetts Patriot and happened to be in Lexington, we hear, to visit with his fiancée, Lydia Mulliken. I also had read that Prescott was there to report on Concord's readiness, its status in hiding supplies and munitions from the British, and its success in moving cannon to Groton lest it fall into British hands. When Prescott left Lexington, it was about an hour past midnight on April 19. On his way back to Concord he met Paul Revere and William Dawes, who had just left Lexington shortly before him and were also on their way to Concord, to warn the town that the Redcoats were on the march. Finally losing his pursuers, Prescott circled about and headed quickly to Concord, carrying Revere's warning to his townsmen. He entered Concord at approximately 1:30 AM and alarmed Colonel Barrett and the Concord militia. Afterwards, he rode on to Acton and then possibly to Stow. While in Concord he triggered his brother, Abel Prescott, who rode to Sudbury. Abel went directly to the home of Thomas Plympton, the leading Whig in Sudbury, and the town's alarm bell began to ring about 3:30 or 4:00 o'clock in the morning. Warning guns were fired to summon militia companies on the west side of the Sudbury River and also in East Sudbury, now Wayland. Within thirty-five minutes the entire town of Sudbury had been awakened. As Author David Fischer wrote: "From Sudbury, Abel Prescott and other messengers continued south to Framingham and Natick, where the militia began to muster between 5 and 6 o'clock. And then again from there to Dover Farms and Needham by another express, who was not known in those towns but would be long remembered as the "bare-headed alarm rider." 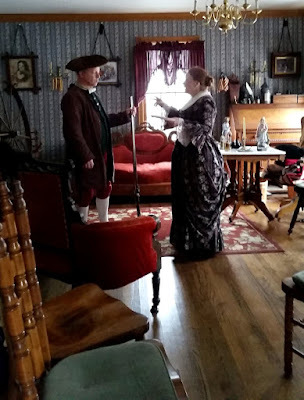 He brought the news to Bullard's Tavern (in Needham) where "Ephram Bullard fired three musket shots from the hill behind his house, giving the agreed upon signal to arouse the town." Distant parts of Needham were awakened by the trumpet of African slave, Abel Benson. From Needham the alarm spread to Newton, and from Dover Farms it raced south into what what is now Norfolk County, circling back toward Boston, whence it all began." In Acton, Samuel Prescott probably triggered the midnight rider Bancroft. Bancroft alarmed Littleton, Groton, Pepperell, Townshend, and Ashby. Both Abel Prescott and Bancroft triggered other riders in the alarm system, and by the time the British reached Lexington they could hear alarms going off and the galloping of horses. It was clear that the men of Massachusetts were aware of the 'secret' British march. By this time, countless riders were also dispatched from other towns to spread the warning—all the while bells and cannon were rung or fired to punctuate the danger at hand. Because of the "midnight" rides of Paul Revere, William Dawes, Samuel Prescott, and many of the other expresses, minutemen and militia everywhere were on the ready, many marching to Concord to effectively engage the British Army at the first major confrontation. Prescott was there to witness the Battle of Concord, then helped to beat the British back to Lexington. In this way he could also ensure Lydia Mulliken and her family were okay and also to help with the wounded. He remained at Lexington as a volunteer surgeon for about two weeks, then seems to have disappeared into the war. There is evidence that Prescott went on to serve as a surgeon in the Continental Army, a tradition that he joined the crew of a New England privateer, and a report that he was in prison in Halifax, Nova Scotia, where he may have died between November 23, 1776 and December 26 (1777?). 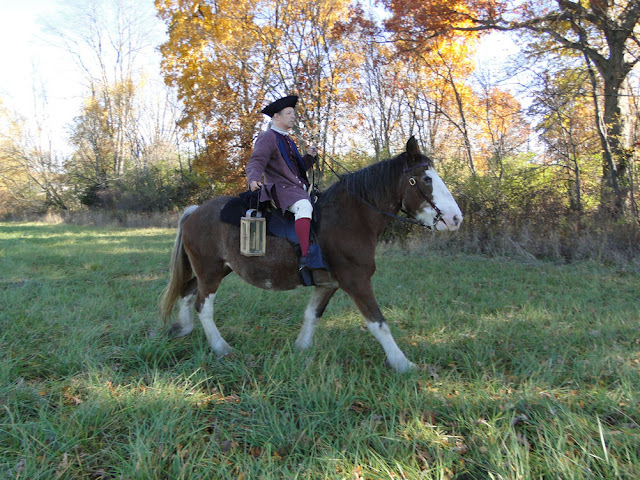 Samuel Prescott's ride is re-enacted every Patriots' Day eve (observed) in the Town of Acton. The re-enactment begins in East Acton, continues through Acton Center, and ends at Liberty Tree Farm, where once was the home of a minuteman named Simon Hunt. The distance is approximately five miles. There is another very important rider who has become one of the great American forgotten patriots that we shall acknowledge today: Wentworth Cheswell of Newmarket, New Hampshire. Cheswell was born on April 11, 1746, to a biracial father and white mother. In Newmarket he was the town messenger for the Committee of Safety, organized by Samuel Adams and the Sons of Liberty, which meant he was to carry news to and from Exeter, New Hampshire. On Dec. 13, 1774, he rode with Paul Revere to warn Portsmouth citizens of the approach of two British warships. 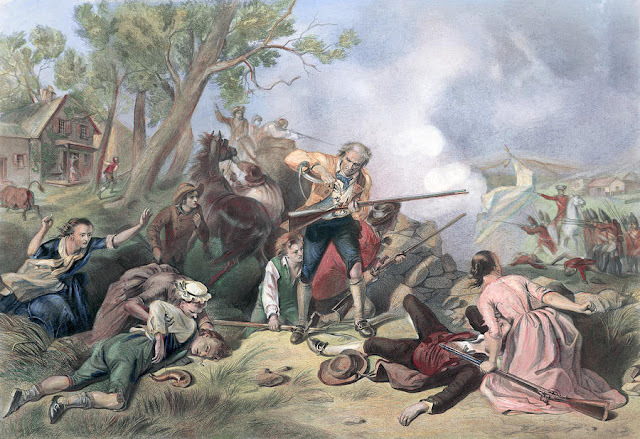 The British intended to retake gunpowder and weapons stolen by the colonists from Fort William and Mary. An interesting side note here is that John Giddings, one of the most active and trusted supporters of the patriotic cause in the Exeter Legislature, commanded a company of men to march from Exeter to Portsmouth to support, if necessary, the party of General Sullivan and Langdon in the raid upon Fort William and Mary in Portsmouth Harbor in December 1774. Undoubtedly, this was due to the warning ride of Cheswell and Revere. The connection for me is that the original homes of John Giddings and Thomas Plympton (who was mentioned earlier) have now been relocated and restored inside Dearborn, Michigan's historic Greenfield Village, and sit directly across the street from one another! 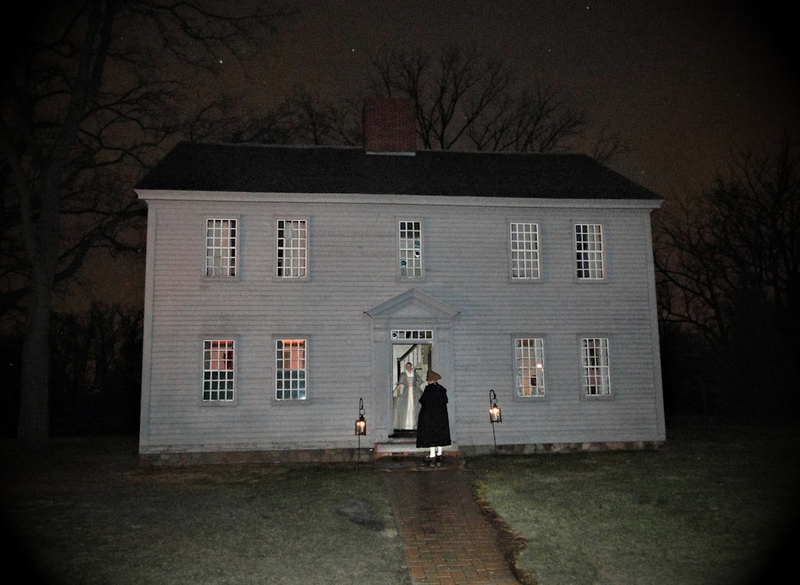 A few months after the Portsmouth Harbor affair, Cheswell Wentworth, like so many others, also played a major part in the hours before Lexington and Concord. I had read that he just happened to be in Boston visiting Revere the night of the famous ride, and when word came out of the Regular's movements, Cheswell eagerly participated and took the northern route to New Hampshire to warn the American patriots that hostilities were about to begin and to secure their gunpowder and be ready. His ride had a similar affect as Revere's and the other riders, and countless minutemen and volunteers mustered and arrived in the Boston area shortly after Lexington and Concord. I've read that up to one third of the Militia fighters who took on the retreating Redcoat Army were men alerted by Wentworth Cheswell. They also assisted with the other volunteers from all the other New England states in surrounding Boston and keeping the British army and navy of over ten-thousand men bottlenecked and trapped in that city. When the American Revolution broke out in earnest, Wentworth Cheswell enlisted in Col. John Langdon’s Company of Light Horse Volunteers and fought at the Battle of Saratoga. 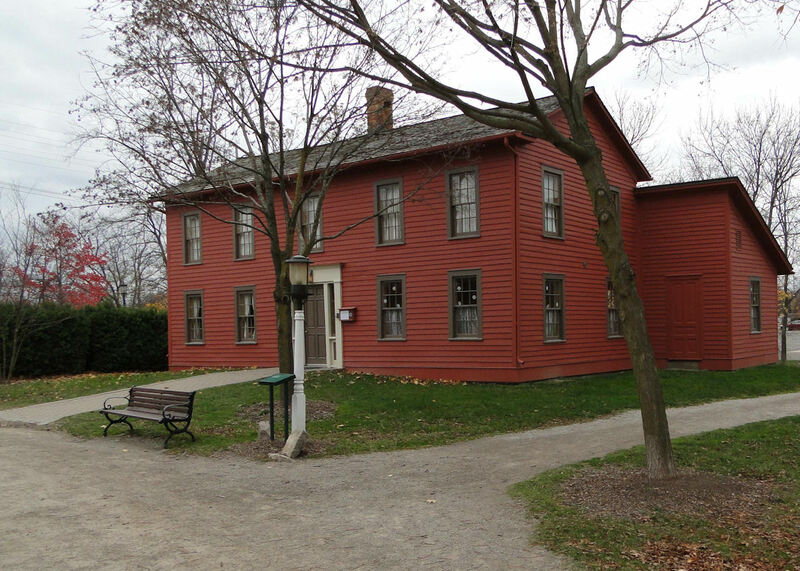 When he finished his military service he returned to Newmarket, where he ran a store next to his schoolhouse. 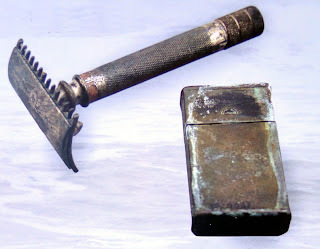 He also did fieldwork and wrote reports on the town’s artifacts. For that he is considered New Hampshire’s first archaeologist. Cheswell died at age 70 of typhus on March 8, 1817, an American Revolutionary War veteran. He and his descendants were buried on his farm. Like those just read about, Israel Bissell was a patriot post rider in Massachusetts. Bissell helped to bring the news to other American colonists of the British attack on Lexington and Concord. He reportedly rode for four days and six hours, covering the 345 miles from Watertown, Massachusetts to Philadelphia along the Old Post Road, shouting, "To arms, to arms, the war has begun," and carrying a message from General Joseph Palmer, which was copied at each of his stops and redistributed. After completing his ride, Bissell returned to Connecticut, where he joined the army alongside his brother, Justis. After the war, he moved to Middlefield, Massachusetts, where he married Lucy Hancock and became a sheep farmer. In the 1790 and 1800 United States Census he is listed in Middlefield, and in the 1820 Census he is listed in Hinsdale. Bissell died on October 24, 1823 and was buried in the Maple Street Cemetery in Hinsdale, Massachusetts. "To study in detail the spread of the alarm, and to observe the towns from which the militia marched to Lexington and Concord, is to understand another layer of significance in Paul Revere's ride. In the flow of information one may discover the importance of the preparations he had made, the impact of his decisions along the way, and the role of his associations with other Whig leaders. Many of the links in that chain (Revere) forged in advance. Others were improvised by (he) and his friends who prudently prepared for the worst case. A major event happened that night in a way that was profoundly different from the popular image of solitary hero-figures, and also from the naive determinism of academic scholarship in (our modern times)." (um, if Brown Beauty could talk!). 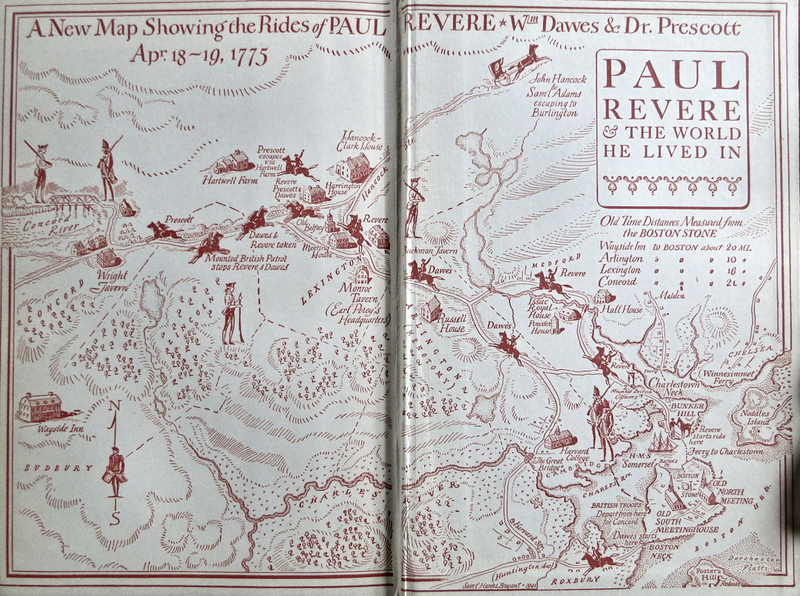 From the inside cover of the Esther Forbes Paul Revere biography. Modern historians like to relegate Paul Revere as more fable than fact, no thanks to Longfellow's poem. But this man deserves his place in our history, and rightfully so, for his ride was as important as nearly any other occurrence of his time. 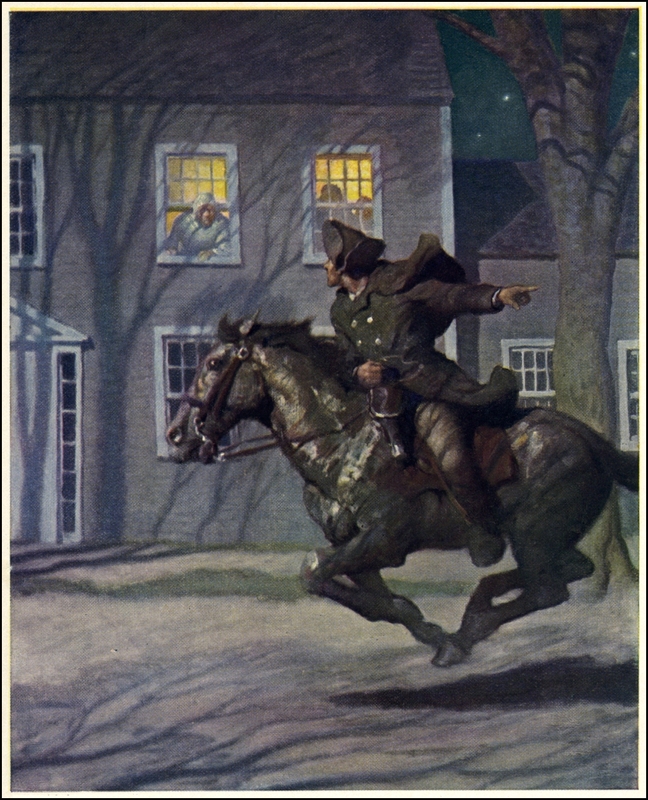 I have searched multiple sources to find the true story of Paul Revere's Midnight Ride, and put it all here. I think you just might be surprised at what Revere actually did. Supposedly, this man was relegated to the footnotes of history due to his name being Dawes. But he, too, has a story to tell of his ride as a partner messenger with Paul Revere. Diaries, journals, letters, newspapers/broadsides, remembrances...this is what I used to garner these very personal stories from those who were there - actual witnesses, men & women, of the Battle of Lexington & Concord. Their tales will draw you into their world. 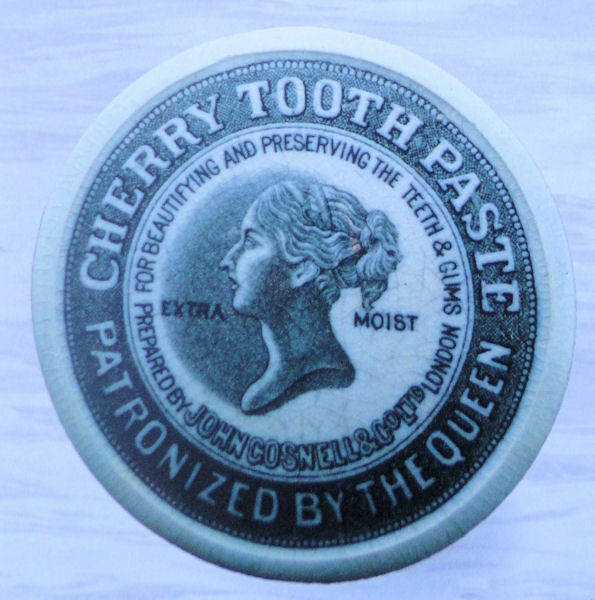 Some say her story is not true, though history tends to side with our young female patriot. Check out what I wrote in this posting and then decide for yourself if her own daring ride is true or just a fable. Paul Revere was married twice and, between his two wives, he fathered 16 children. An amazing collection of original Revolutionary War artifacts on display for all the world to see, telling the story of America's fight for Independence. An original Stamp Act notification. A letter written by Benedict Arnold. George Washington's camp bed, a coffee pot made by Paul Revere, a writing desk that once belonged to Thomas Jefferson...yeah...this is some great stuff here! There is so much more to this most important American document, from the idea to composing to printing - who is going to print this? - to delivery...oh yeah, there is a lot more history to our Declaration than I ever realized! Something very special happened almost 250 years ago, but is that story being promoted? 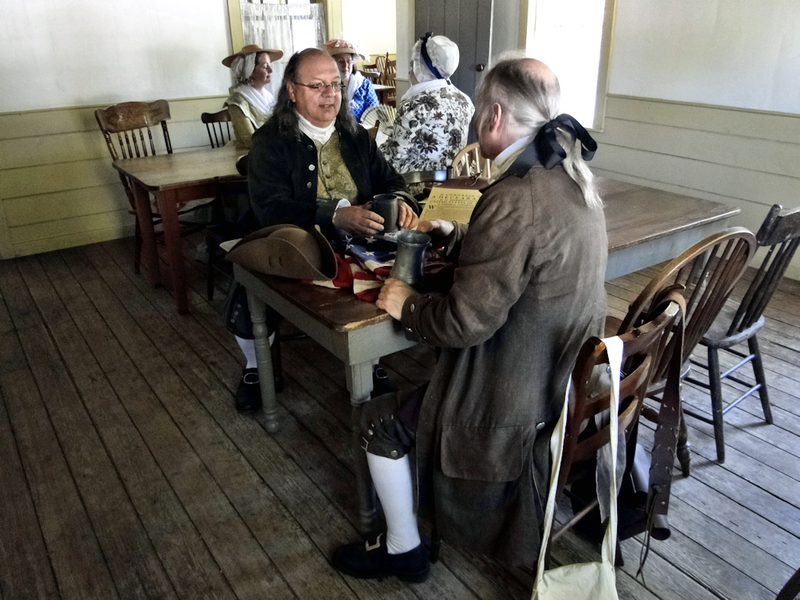 Come on a time-travel visit to colonial America during that hot summer of 1776 and learn, first hand, of the accounts on how we were making a new and independent nation. The long air-conditioned (or heated) car ride. Motels without a pool! Can we stop at McDonalds? I'm hungry! Ahhhh....modern travelers never had it so good. I've always had a fascination of travel back in the day, and I decided to find out as much as I could about them. I wasn't disappointed - - - I dug through my books, went to a historic research library, 'surfed the net' (does anyone say that anymore? 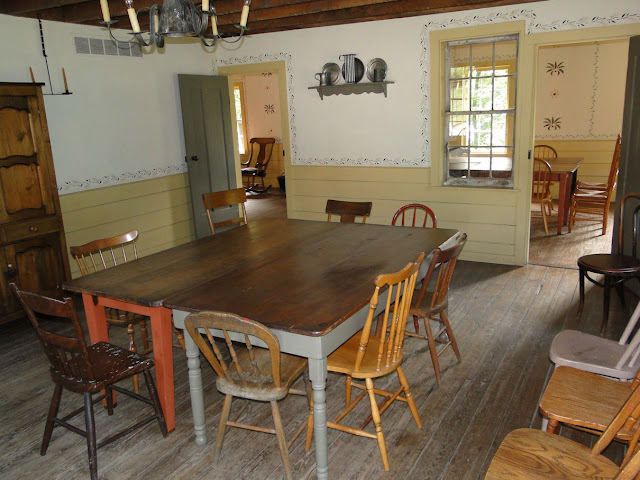 ), and asked docents who work at historic taverns questions, looking for the tiniest bits of information to help me to understand what it was like to travel and stay at a tavern in the colonial times. This post is the culmination of all of that research. Our country's founding relied greatly on the tavern. No stoves or fast food restaurants. Everything made from scratch. What was it like for our colonial ancestors to prepare, cook, and eat their meals, and what kinds of food were available to them? How did they keep their foodstuffs from spoiling and rotting? If you have questions such as this, I believe you will enjoy this post. A concise pictorial to everyday life in America's colonies. 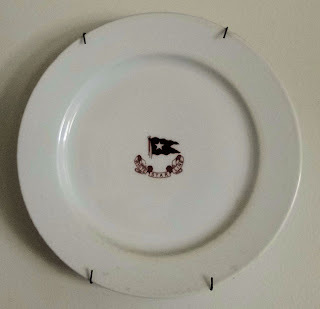 And I do mean "pictorial," for there are over 80 photos included, covering nearly every aspect of colonial life. I try to touch on most major topics of the period with links to read more detailed accounts. This just may be my very favorite of all my postings. If it isn't, it's in the top 2! 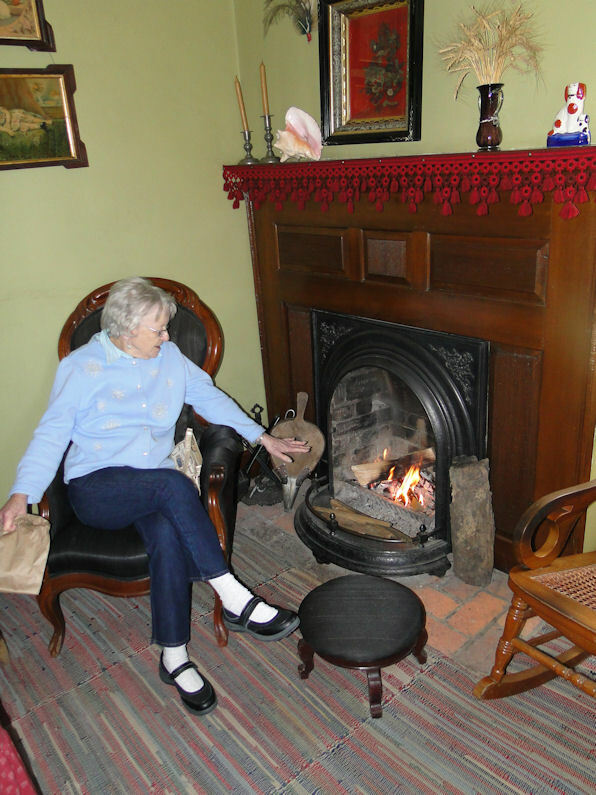 Could you survive living in the era before electric lights or even before the 19th century style oil lamps? Do you know how many candles you would need for a year? Do you know what it was like to make candles right from scratch, or what it was like to visit your local chandler? That's what this posting is about! I am so excited! I mean, simply elated!! If you are regular readers of my Passion for the Past blog, then you know of my passion for Patriot's Day, and are probably aware of my annual rant about the lack of a Patriot's Day commemoration in my home state of Michigan. But this year I decided to put my money where my mouth is (literally, in all honesty). April is such a historical month, and one of the most important dates is April 19th, when what is widely considered the beginnings of the Revolutionary War began on Lexington Green and then on to Concord. But most ignore this so-important date in our Nation's history. And I feel the need to bring it to light. It is unfortunate that Patriot's Day - April 19 - is only celebrated "officially" in four states: Massachusetts (of course), Maine, Wisconsin, and Connecticut. That is, it is on their state calendar as a holiday. I think that's a shame! Patriot's Day, for those who are unaware, is a commemoration of the beginnings of the American Revolution, including the ride of Paul Revere (& other couriers), as well as the Battles of Lexington & Concord. In and around Boston, in which it all actually took place nearly 250 years ago, this date is remembered with reenactments of the three most well-known riders - Paul Revere, William Dawes, and Samuel Prescott - as well as the battles themselves Then there's the Boston Marathon. In my opinion, the anniversary of the Battles of Lexington & Concord is such an important day and date, and shouldn't be a local' Boston thing, and, instead, at the very least, be acknowledged in each of our 50 states, right along side Pearl Harbor Day of December 7 and the attacks we endured on September 11. But for us who live in the Great Lakes State, the date of April 19, which also should live in infamy, is all but forgotten. 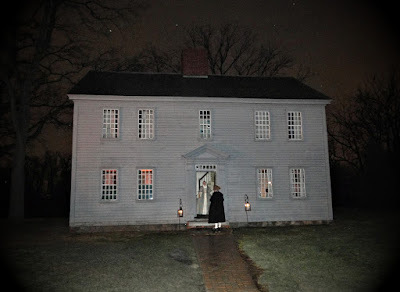 I remember it was in 2014 and I was dressed in my colonial clothing when a curious young man, who was probably around the age of 9 or ten, came up to me and asked why I was dressed the way I was, with my tricorn/cocked hat, knee breeches, and buckled shoes. 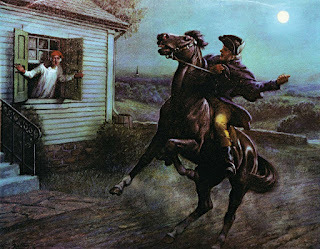 Since the date just happened to be April 18, I explained to him its significance, and how "239 years ago tonight, Paul Revere would make his famous ride, warning the countryside that the regulars were out, and they were coming this way!" This young man was thrilled to hear this and immediately ran to his mother, shouting, "Mom! Do you know what happened 239 years ago tonight?!?" and proceeded to tell her. Only a few minutes later I saw the boy pretending his mother's umbrella was a musket and he was 'shooting' the Redcoats, shouting "The British are coming!" I corrected him to yell "the regulars are on the march tonight," which he did (and gave him credit for knowing who Paul Revere was!). I then explained that the following day, April 19, would be the 239th anniversary of the beginning of the war for our nation's Independence - the American Revolution. His eyes grew large with excitement; he loved it. How exciting for him to hear of our nation's history in this manner. How exciting for me to teach him something that one hardly even hears about anymore. Yes, this was a wonderful opportunity for me, as a historian, to be able to teach, off the cuff, American history to a young lad who was eager to learn. than just the two of us to help stave off General Gage's Troops! 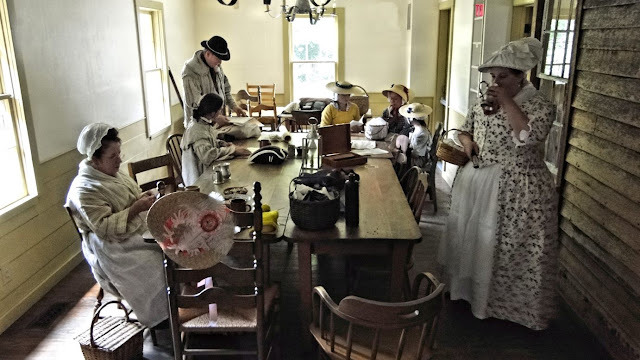 You see, for years I have been doing my part to spread the word by dressing in period clothing and venturing out to Greenfield Village to pay a sort of homage to our founding generation. Sometimes I go alone, but usually I am with a few other living historians. I really can't explain what mentally happens to some of us when visiting a historical place while in period clothing. I suppose, in a way, it allows us to 'be' that much closer to the time period in which we emulate. A sort of mind-travel. 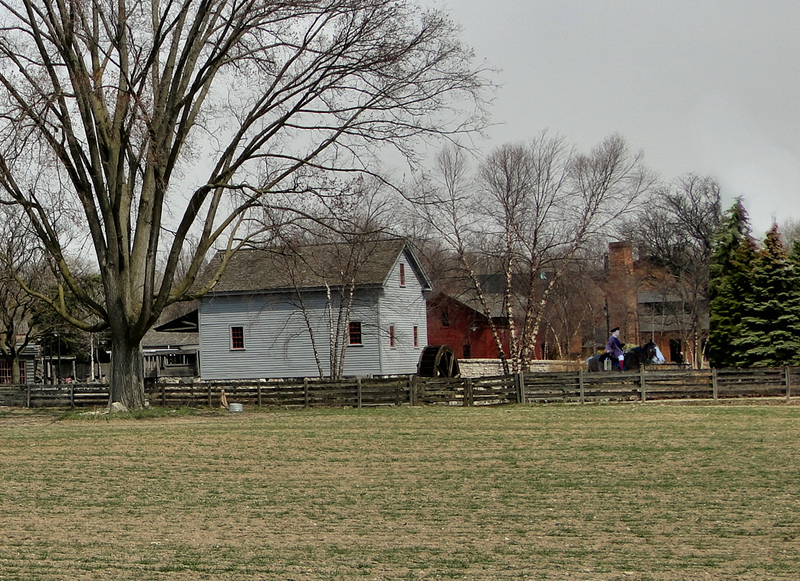 However, because I am not a Greenfield Village employee, and it is not an actual reenactment, I do my best not to interact too much with the visitors, aside from giving a friendly smile and nod of the head. Every-so-often, though, a conversation may strike up, and given that I choose not to be rude, I do speak with them, but informing them first thing that I am not an employee of The Henry Ford, just a patron who loves to experience history through a form of immersion. This house, originally situated in Sudbury, Massachusetts, was where, in the early morning hours of April 19, 1775, a warning rider, Abel Prescott (whose brother, Samuel, just rode with Paul Revere a few hours earlier), let Whig leader Thomas Plympton know that the Regulars were on the march toward Lexington and Concord. So for me this is the perfect place to be on such a day and date. But what to do about Patriot's Day itself? Well, as was announced at a meeting for members of my Citizens of the American Colonies reenacting group earlier in March, I am planning an actual first time in a long time commemoration to be held here in the Metro-Detroit area of Michigan to celebrate the events that occurred on the beginnings of the Revolutionary War and in 1775 in general. This is a personal thing for me, to celebrate this important date with living historian friends...and the public...to get the word out. living history group, including yours truly, dressed up for our meeting. So, this year I plan to take it a step further. No, not at Greenfield Village, but, rather, at historic Mill Race Village, located in Northville, Michigan. 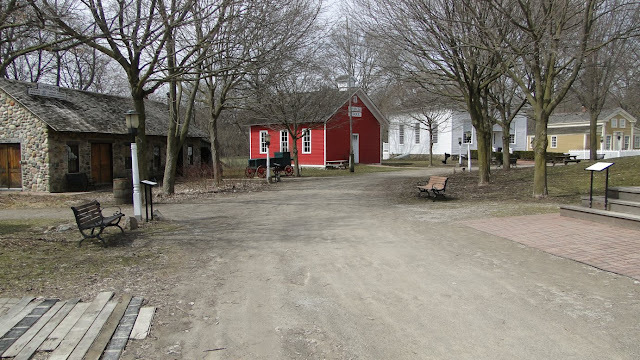 Mill Race Village is a fine collection of mostly 19th century structures taken mostly from the city of Northville and restored into a beautiful Victorian park setting (but works swimmingly well as a colonial village). If you follow my blog here then you know that my reenacting group has participated in the Mill Race 4th of July celebrations for the past couple of years, and we plan to do so again this year. I took it upon myself to contact the powers-that-be at Mill Race and sent a proposal for a Patriot's Day event. The reply didn't take long, and after a few e-mails back and forth, a couple of meetings ensued - some in person and a few phone calls - and happily they are giving me the go ahead to put such an event together! All of this was brought up at our 'Citizens' meeting, and the excitement began to build as plans were laid out. There are other reenactors who I have been working with on this - Tony, Dalton, and Scott - (and others) that have been helping with their thoughts and opinions as well, and between us there are a good many years in the world of reenacting notched on our belts. The date chosen for this year will be April 28, for the actual Patriot's Day of April 19th falls on Good Friday this year, and it was decided since that was Easter weekend that we should postpone it for another day and date. ~First of all, we initially decided not to have a battle. But after a visit to Mill Race with one of the British military reenactors, it was decided we could easily replicate what happened on Lexington Green back in 1775 on a (much) smaller scale. 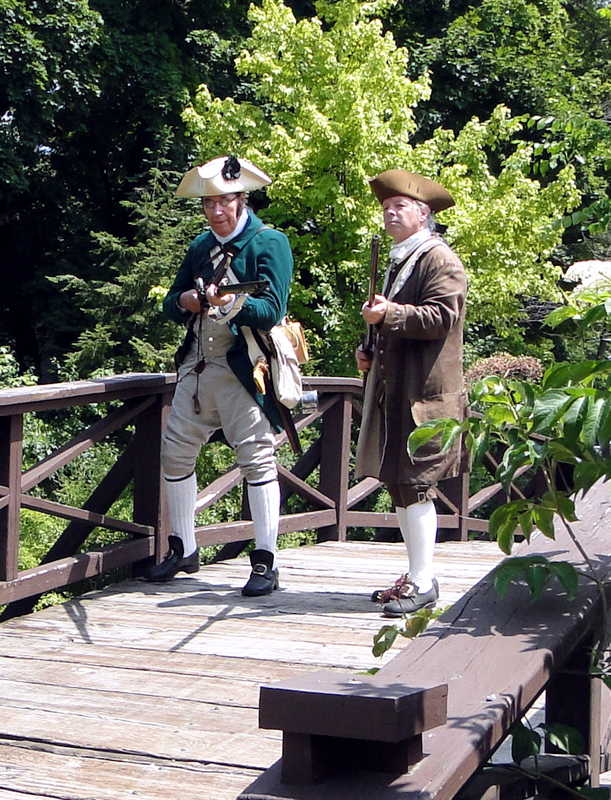 There will also be another skirmish a while later on the Concord Bridge replication, again, giving an idea of what occurred in '75. 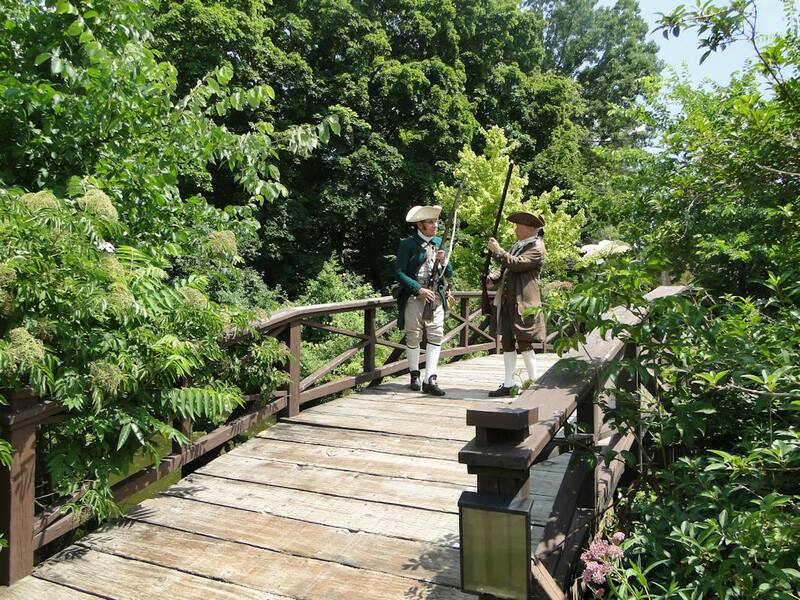 There will also be a demonstration of the firing of musketry for the visiting public. ~Second, I am hoping for a more "1st person" sort of feel. In other words, I am asking that participants use "I" and "we" rather than "they would have." I'm not necessarily asking for immersion, and I'm definitely not saying to ignore visitor's questions about occurrences after the year 1775. Rather, I am encouraging us to stay in the 1775 mindset, though allowing for opportunities to speak of 'future' occurrences of the Revolutionary War would be fine, as long as we bring it back to 1775. My thing is I would like our patrons to feel as if they are visiting the past, like they may have stepped through a portal in time, so it's important that participants stay "in the period." ~Third, tents are not necessary. Flies would be fine for presentation purposes, if one so desires. But I prefer to keep it without tents so the naturalness of the historical grounds can shine. Speaking of which...no ground fires. Nope. Nada. Uh uh. Not at all. Don't even ask. ~Fourth - - - We can utilize a couple of the historic buildings, which is pretty cool in of itself. 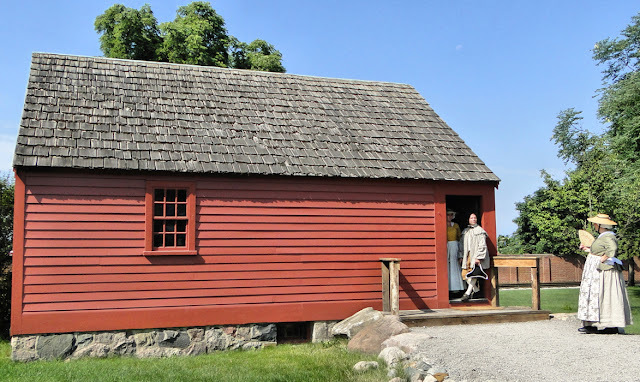 I have designated the Cady Inn, originally built in 1835, as a representation of Buckman's Tavern from Lexington, Massachusetts for our Patriot's Day. The 1835 Cady Inn can easily pass as a colonial tavern. A quick couple of lines about Buckman's past: having received word that the Regular Army had left Boston in force to seize and destroy military supplies in Concord, it was at Buckman's, under the leadership of Captain John Parker, where several dozen militiamen rallied before gathering on the town common in formation to wait upon the arrival of the Regulars. 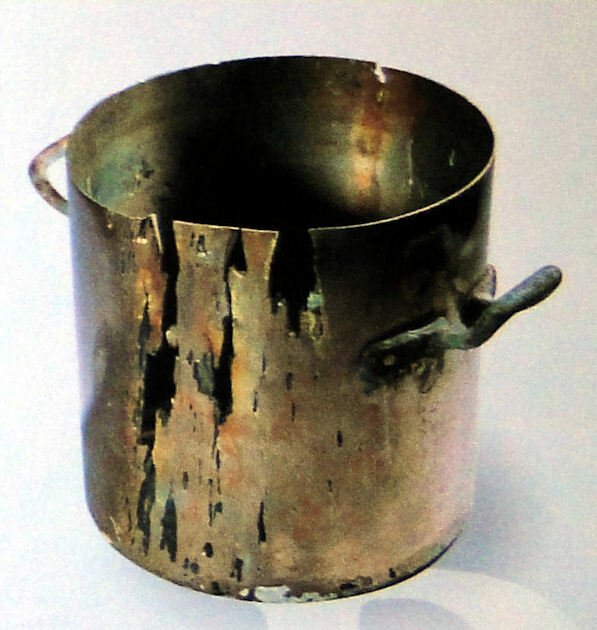 As the King's army had not made it to Lexington yet, the men eventually went into the tavern, emptying their firelocks beforehand, as etiquette would have, before passing through the entry, to await the arrival of the British troops (it was common practice at the time to not enter a tavern with loaded musketry). Definite word reached them just before sunrise, and Captain Parker's company of militia left the tavern to assemble in two ranks on the common. Inside the original Buckman's Tavern in Lexington, Massachusetts. Captain Parker ordered his militia "not to meddle or make with said Regular troops (if they should approach) unless they should insult or molest us." 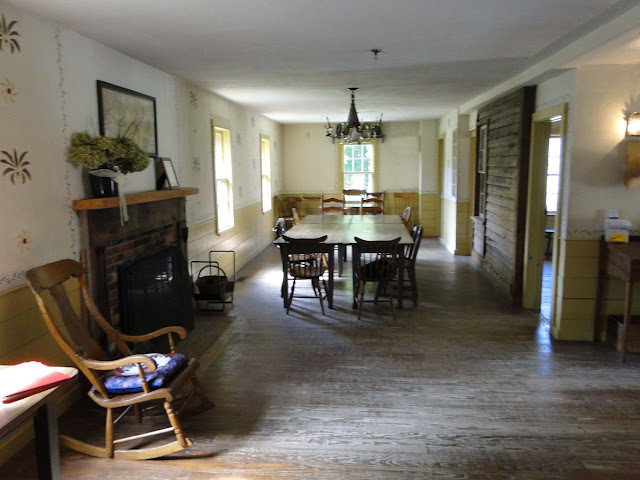 I have been in numerous historic taverns from both the 18th and 19th centuries, as well as gazed at pictures on the internet and in books, and noticed these inns/taverns/ordinaries, for the most part, did not change all that much between the two centuries, especially the interiors. Cady Inn is not much different from Buckman's. In fact, the similarities are pretty striking. So I feel the Cady Inn, even though it was built in 1835, is well-suited as a depiction of an 18th century 'publick' house. Yes...a fine Buckman's it can be. Now, we know that the British Regulars were only marching through town, therefore we decided it best to designate Mill Race's red school house down the road a piece as the red-coated reenactor's place of presentation for the public. It will give them the room they will need, they can form up without crossing the 'Buckman' lines, and congregate as they feel the need. 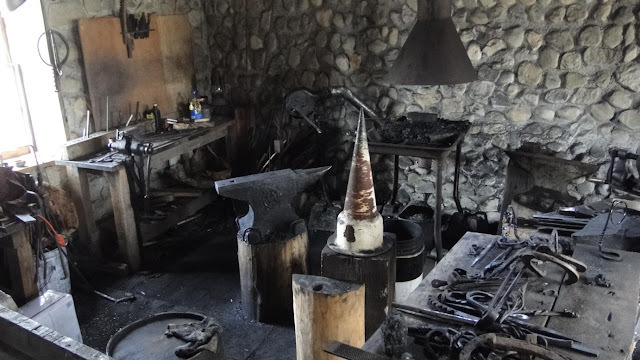 Only the blacksmith shop separates the Patriots from the King's Army. I see a painting of George Washington hanging on the wall. Methinks the Regulars will find a different George as a replacement. 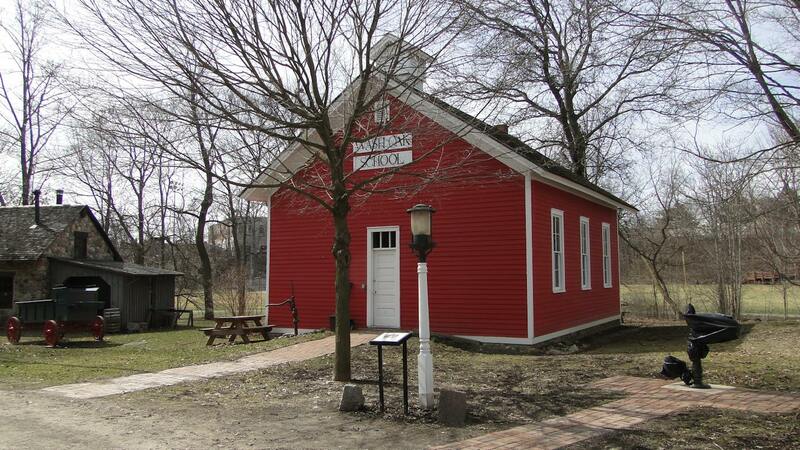 Inside the school house cupola is a bell that will be rung as we watch the Regulars march up the road toward our town. I, as Paul Revere, also plan to move through the town, knocking on doors to let everyone know that the Regular's are on the march. This is definitely something I hope to be able to do at a reenactment someday! (I am riding my friend, Jason's, horse here on his farm). We will also have a blacksmith on hand in the blacksmith shop. Not sure how he'll be dressed, but I requested to have him there for an extra added attraction. ~Fifth - - - Presentations. I already have a few folks who are planning to represent actual people who were there back in 1775: I plan to speak as Paul Revere and of my ride the night before, and we have a reenactor who is interested in portraying Captain John Parker, who commanded the Lexington militia at the Battle of Lexington. We will also have a doctor/surgeon on hand who plans to bring the "tools" of his trade to show our visitors what would have happened should someone get shot in an arm or leg. He, too, is a collector of historic flags and plans to bring a few that were known during the Revolutionary War. I will also have a few historic flags on hand as well. The flag you see here on the left was first adopted on October 21, 1774 after the Sons of Liberty had forced out American Loyalists from Taunton, Massachusetts. 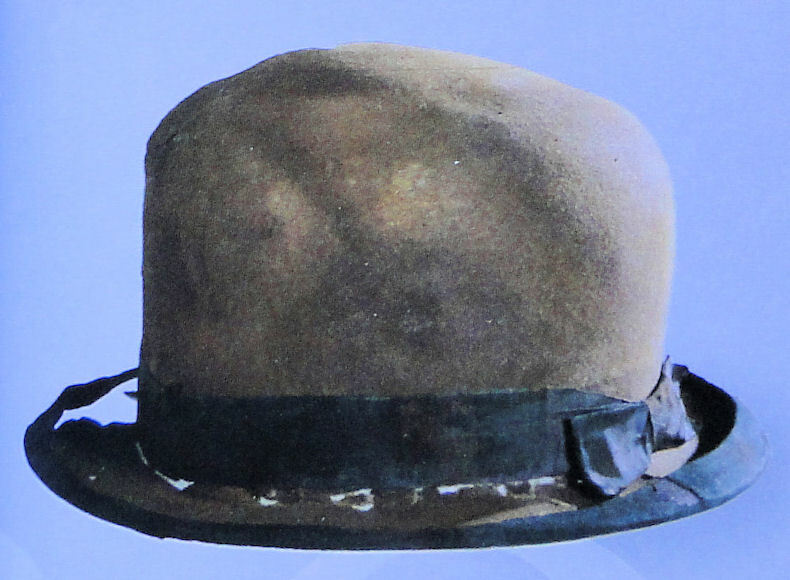 Reverend Caleb Barnum proposed a plan for a symbol of defiance against British rule. In commemoration, the Patriots erected a liberty pole, 112 feet high, outside of the Taunton Courthouse and the house of Tory Loyalist lawyer Daniel Leonard. On it, they raised a red ensign with the words "Liberty and Union" sewn onto it. 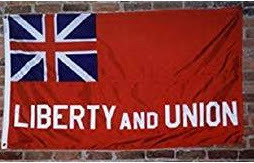 The Taunton flag was one of the first rebel flags used within British North America to express dissension against the British government and The Crown. It also initially symbolized underlying loyalty to the Crown as the Union Jack was viewed as the King's Colours. The popularity of the flag grew due to the Boston Evening Post publishing it in a story. The wife of William McKinstry, the only Loyalist permitted to remain, expressed her disdain for the Taunton flag and in response female Patriots dragged her from her house and forced her to march in front of the liberty pole where it was flying. A later version of the Taunton Flag was created including the "Liberty and Union" slogan on a Union Jack. I love teachable moments such as this, for far too many believe only the "Betsy Ross" flag was flown (not until 1776), so this is one of the numerous flags that will be shown at our Patriot's Day presentation. There will be another gentleman who will display two long guns of the period to lecture on as well: one a French Fusil Fin and the other an American 45 caliber flintlock rifle. Both are high-end contemporary originals. 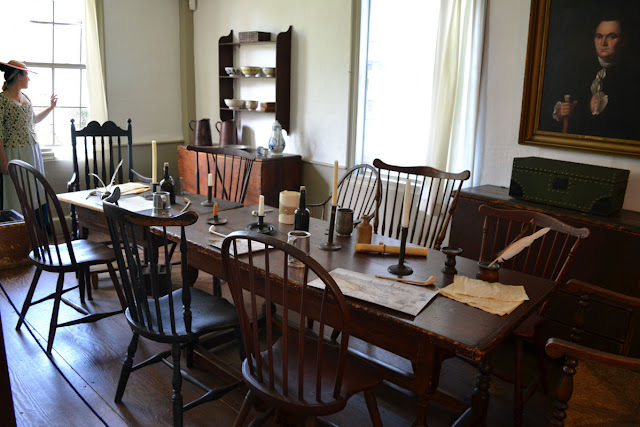 To help keep the well-roundness of the times, we will have a couple of spinners and their wheels on hand to show common everyday 18th century life, along with one or two ladies hand-sewing period garments. 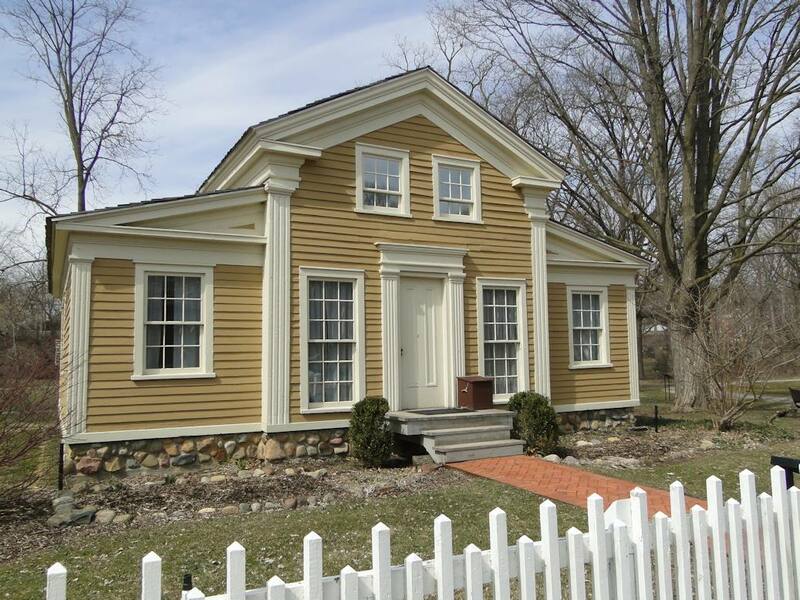 The 1851 Hunter House will become an 18th century home on April 28th where our ladies can spin and sew. The inside of the Hunter House has numerous spinning wheels and accessories such as the yarn winder. But what's that hanging on the wall? And the ladies will be speaking of the importance of women's roles during the beginnings and throughout the Revolutionary War. This will be a fascinating look at home life of the time. And, yes, we will have Benjamin Franklin as well. You may ask, Benjamin Franklin? Why? He wasn't in the area at all. Speaking to our own Dr. Franklin, Bob Stark, he told me his plans for Patriot's Day is to speak of this spy business as well as the Hutchinson letters affair, which was the catalyst of him becoming a Patriot. So, yes, I believe having Ben Franklin at our Patriot's Day event is well-suited. There will be numerous other known and unknown 18th century folk on hand as well, including a serving wench (a woman who worked outside the home) inside the tavern and other Patriots & Loyalists as well. Road to and from Boston...at Historic Mill Race Village in Northville, Michigan. 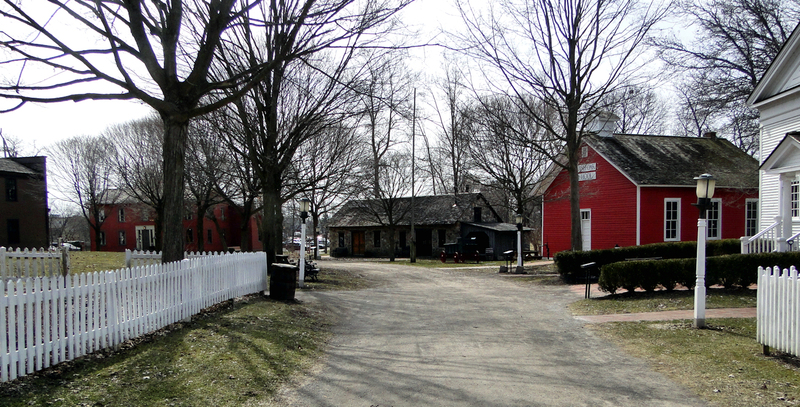 The lay out is practically perfect: period structures along a tree-lines winding road, a village green, a replication of the Concord Bridge...I cannot think of a better place locally here in metro-Detroit to reenact the 1775 occurrences of Lexington & Concord than beautiful historic Mill Race Village. Is that the Concord Bridge I see? So, it looks like my dream of celebrating Patriot's Day here in Michigan, with a full-fledged reenactment, is coming to pass, and I dearly hope that it is a success. But it will only be a success if the participants all join in and make it so. And if it does work out as well as I hope, I have ideas that I've been bouncing off reenacting friends for future Patriot's Day celebrations; by following the events of the sestercentennial of America's fight for Independence we can include, for starters, commemorating the Boston Massacre in 2020, holding a Boston Tea Party in 2023, maybe add the Battle of Bunker/Breed's Hill as an extra bonus to our Patriot's Day in 2025, and, of course, truly shining in 2026 for the 250th anniversary of the Declaration of Independence. In addition we can also work on replicating, as best as we can, some of the skirmishes and perhaps other battles, depending on the participant interest. Yes, I am already thinking that far in advance, but the way I see it, we're at the ground level here, so we can really build on this sestercentennial. I've put together similar events for the local Civil War reenacting community, including the battle of Gettysburg, a country fair, a medical scenario after a battle, and the events of the picnicking public at 1st Bull Run, and all have been very successful. But none would have been successful with out the willingness and help of the reenactors and living historians. Sure, there are a few naysayers, but then again, there always are. I don't let them bother me or bring me down. If that's the way they want to be, so be it. They don't need to participate. I can't and won't allow them to destroy something I enjoy so much and look forward to. Anyhow, this is something that I hope and even pray turns out well. It just might be the start of a new historic tradition. My cocked hat is off to the fine people of Mill Race Village for allowing us to put on such an event. 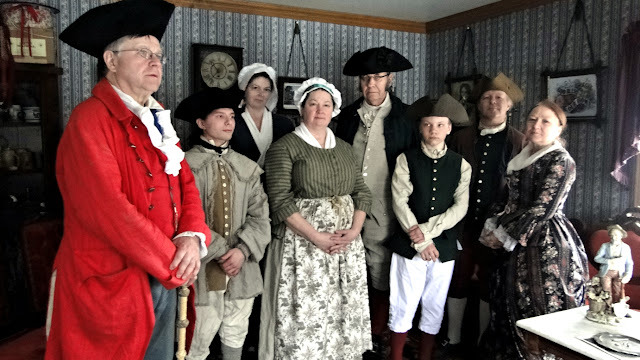 My wife and I and members of our family practice living history and portray citizens during the era of the American Revolution (1770s) and Civil War (1860s). You'll find us very often at mid-18th or 19th century reenactments doing our best to replicate the eras as accurately as we can in clothing, manners, speech, and other ways in order to bring the past to life. 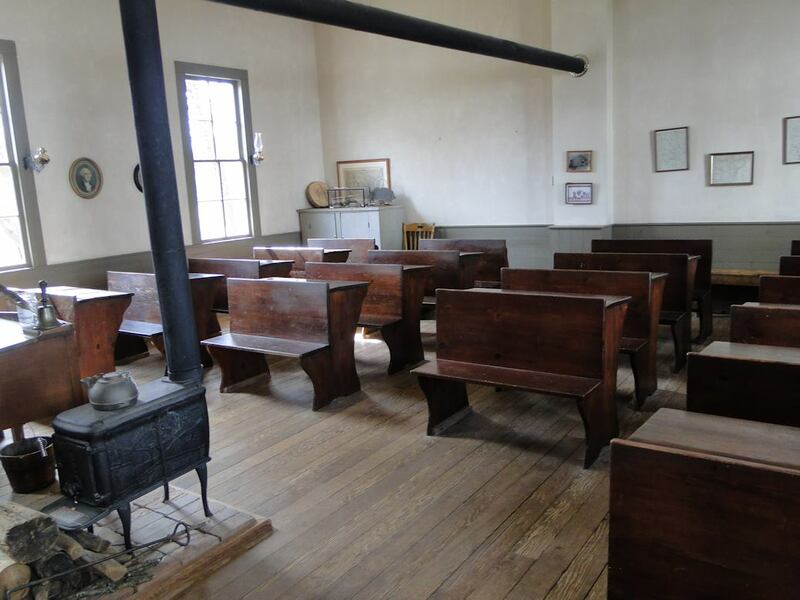 I believe knowledge has to be the top priority in living history; knowing about the time period you are presenting - absolutely knowing - can make all the difference in how serious you are being taken. 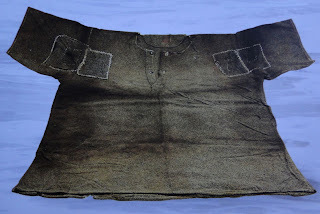 Too many focus solely on clothing...but what I am attempting in this Passion for the Past blog is to help living historians and general history fans to look beyond the obvious - to study life as once lived. Yes, clothing is important, but it only tells a small part of the story. To give a more complete picture one needs to look at the 18th or 19th century world around them - to put themselves in that world - and then they will be able to develop more fully a presentation of greater interest for not only the general public, but for themselves as well. I hope you like it.